Merry Christmas from Carla Stewart! The year is 1938. Imagine for a moment that you are six years old and dreaming about what might be under your tree on Christmas morning. A doll perhaps? Or a warm pair of stockings? Perhaps even a tea set so you and the girl down the street can have tea parties. 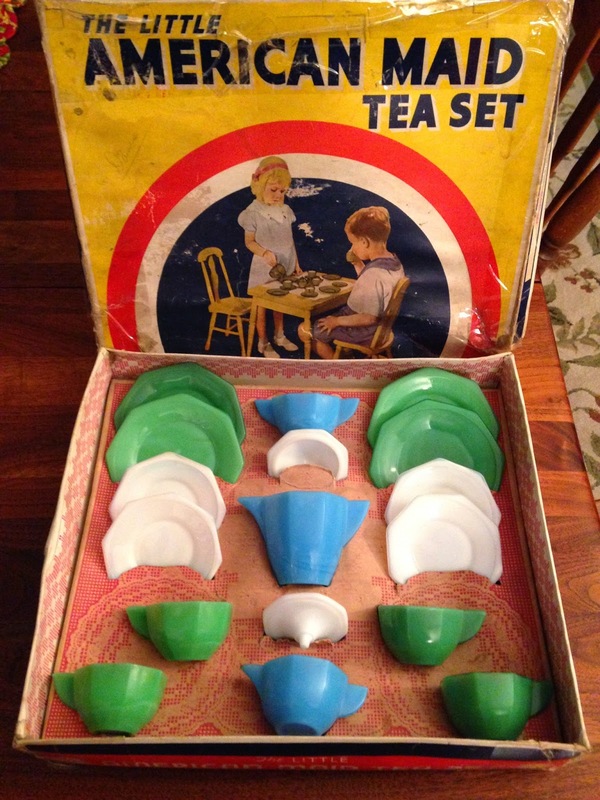 Many fortunate girls probably found just that as that was the year that the Akro Agate company came out with their American Maid tea set. They're not china, nor metal, but a sturdy opaque glass that you might think looks familiar - like marbles perhaps. You would be right. 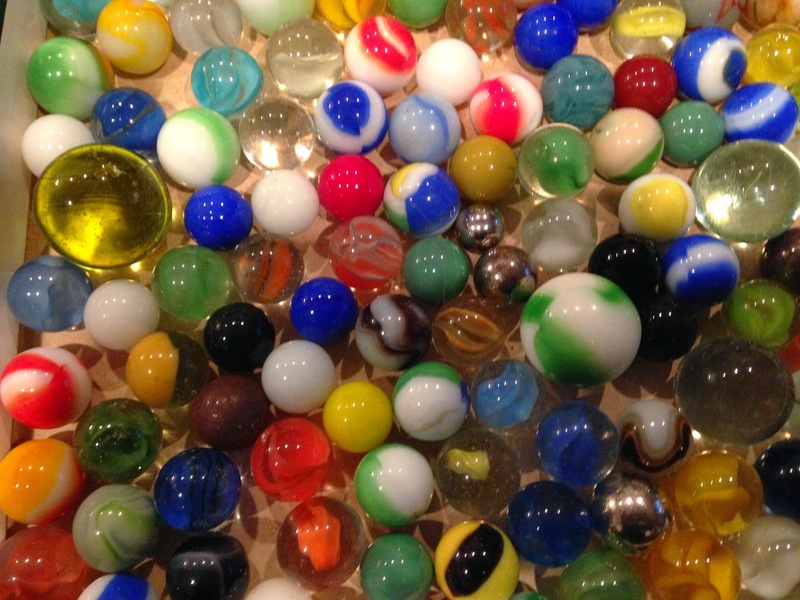 In 1911, the Akro Agate Company was established to make marbles, and they thrived primarily because marbles weren't being imported to America from Germany during WWI. They did so well, in fact, that after the war, they continued to corner the market on marbles since their production costs were low and they didn't have to charge import taxes. By the 1930s, the company began dabbling with other lines of glassware: ashtrays, bells, baskets, flower pots, jardiniered, lamps, powder jars . . . and then children's dishes. The children's line came in two sizes: small (doll-sized) and large (child-sized). 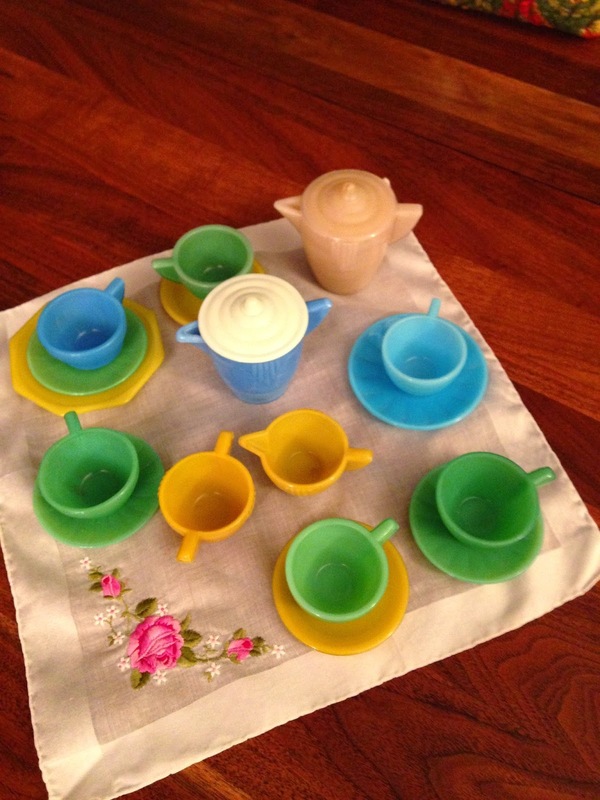 A set included a plate, saucer, cup, cream pitcher, sugar bowl, and pitcher with lid. They didn't take off at first as practical mothers preferred metal play dishes, but when the Akro Agate company began to make multi-color sets (like the one above), their popularity increased and continued throughout the forties. The dishes come not only in different colors, but also different patterns (octagonal, raised daisy, concentric ring, stacked disc, interior panel as well as others). Some of the colors are quite rare (pumpkin, purple, lavender) and all of them are difficult to find today as collectors (like me) have snatched them up. My sister was the first to introduce me to these charming dishes, and I began buying them for her when I saw them (including a coveted lavender cup), and after a while, I decided I would start my own collection. I love them, and am fortunate to have received the boxed set above (original box which increases the value) from my mother's antique business after she passed away. Don't worry: My sister got the other boxed set! I've placed some of the "small" pieces on a ladies handkerchief so you can get a feel for the size. A saucer is about 2 1/4 inches across. They're fun to collect, don't take up too much space, and are nice conversation starters. Oh, yeah, if you were a boy in 1938, you, too, would've been happy with an Akro Agate gift under the tree on Christmas morning - A new marble set! Here are some that my dad gave me. Akro Agate went out of business in the early fifties after forty years of bringing smiles to American kids. What was the best gift you ever found under your tree on Christmas morning? Do you still have it? Do you collect any unusual items? I love those dishes! I will have to look for them! I love them, too, Connie! They're hard to find, but when you do, they are sometimes in the glass cases of antique shops with other small items. There are also antique glass shows that feature them - often at a hefty price, though. Good luck!! And Merry Christmas. Ah, the days when plastic was not the go-to material! Wonderful post. This made me smile, Davalyn! It's hard to imagine a time before plastic, isn't it? I'm glad you enjoyed the post. Have a wonderful Christmas. I wanted one of those sets for Christmas but didn't get them because money was tight the year after the war started, and all our gifts were homemade or bought at Woolworth's Five and Dime.. My most memorable gift was my life-size baby doll when I was 8 in 1944. I did get a China Tea Set from my grandmother when I was 10 and I still have one of the little plates from it. Thanks for sharing your memories, Martha. I'm so sorry you didn't get an Akro Agate tea set and glad you later got a china one. I should look up how much the American Maid sets were when they were introduced. I LOVED those life-size baby dolls - my new grandson reminds me of them with their round cheeks and milky-white complexions. Merry Christmas, Martha! Is this the same glass as the green glass that Martha Stewart popularized? I think it's from the Depression era as well ... I had a friend who loved it so that I gave her some of the pieces I had picked up at garage sales because I didn't care for it all that much ... and we have since been amazed at the prices we've seen on similar pieces since then ... thanks to Martha. I loved learning about this. Thanks for the history lesson on glassware! Thanks, Stephanie! I tried to answer earlier but I'm on the road today and my phone kept rejecting the comments. Wish we lived in simpler times. To answer you, the glassware Martha Stewart made popular was Jadite manufactured by Fire King. I'm pretty sure it was the 40s and 50s, and I think it was meant for everyday ware. It has a similar look to Akro Agate but made by different companies. Also you can see faint light through the Akro Agate when you hold it up to a lamp. I'm not a great expert like my mom was, but I, too, think it's fun to learn the history. And you are a GREAT friend to buy the Jadite for your friend. National Park stamps - What a fun thing to collect - and they don't take up much room, which is always a plus. I'd love to know all the places you've traveled.